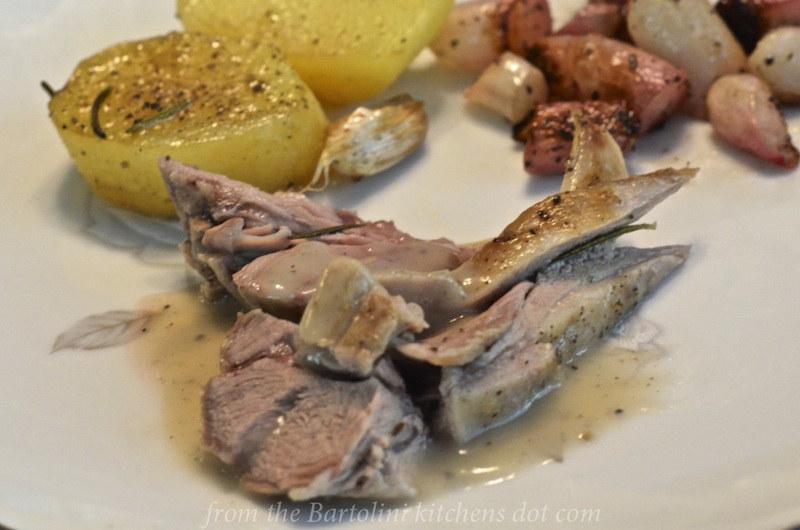 This is the second and last post using leftovers from the duck that Zia and I roasted and that I blogged about in early September. Last week was the first when I shared our recipe for duck ravioli. Today’s post resulted from a dinner I served Zia during The Visitation and, in doing so, we used the very last of that duck, save for the quack. To start, make a stock by placing the roasted duck carcass in a large pot of cold water after removing and reserving any pieces of meat that may still cling to the bones. Into the same pot, add a large quartered onion, 2 roughly chopped celery stalks, 2 roughly chopped carrots, a few sprigs of parsley, and a quartered tomato. No need to season the stock for the carcass is already seasoned. Bring the pot to a boil before reducing to a simmer. After 2 hours, strain the stock and use it in today’s risotto. Now, I’ve already shared 4 risotto recipes (Bartolini, Turkey, Strawberry, and Tricolor risotti) so there’s really no need to go into great detail here. There are, however, a few things to note with this particular recipe. In this recipe, I used dried porcini mushrooms. (I’ve yet to find fresh ones here but the search continues.) To hydrate them, place the dried mushrooms in a bowl and add very hot water. I tend to avoid using boiling water, as some might suggest, for fear that it may partially cook the mushrooms. After 20 to 30 minutes, carefully remove the now plump mushrooms and coarsely chop them for use in the recipe. Take the leftover water and add it to the heated duck stock, being careful to leave behind any of the grit that may remain in the bottom of the bowl. The stock will now be both duck and mushroom-flavored. To prepare the risotto, in a medium sauce pan, melt a couple tbsp of butter over med-high heat. Add some finely chopped shallots and sauté until soft. Add some minced/grated garlic and continue cooking for about a minute before adding the reserved duck meat and the chopped reconstituted porcini mushrooms. Sauté for a few more minutes and then add the rice. Cook the rice, stirring frequently, until the grains are toasted — about 5 minutes. Reduce the heat to medium, add about a half-cup of dry white wine, stir, and cook until almost all the liquid is absorbed. Repeat the process with the heated duck stock (See Notes), adding more liquid, stirring, and allowing it to be absorbed before adding another ladle or two more. Once the rice is cooked just about to your preference, add another ladle of stock, cover, turn off the heat, and allow to rest for 5 minutes. Next, remove the cover, add 2 tbsp of butter, if desired, and about 1/2 cup grated Pecorino Romano or Parmigiano Reggiano. Stir well and serve immediately, garnished with more grated cheese. Black rice should be rinsed before use to remove any inedible bits — pebbles, sticks, and the like. If you wish to lower the cooking time, the rice may be soaked before cooking. The longer it is soaked, the less time will be needed to cook it. Though I’ve never done this, I did see where some have soaked it as long as overnight. Always use heated stock when making this or any risotto. Using cool or even warmed stock will greatly increase the cooking time. On the other hand, do not use stock that is boiling. Stock that is too hot will evaporate when it hits the rice-filled pan before it can be absorbed by the grains. This isn’t so much a look back as it is a footnote to the 3 duck-related posts. In the past, I’ve suggested that you use leftover scraps of pasta dough to make quadretti. (Remember: waste not.) That’s what I did when I made last week’s duck ravioli and, with a cup of today’s duck stock, I enjoyed a delicious bowl of duck soup for that day’s lunch, all the while contemplating the challenges faced by the country of Fredonia. This entry was posted in Family Recipes, Pasta/Rice/Soups (Primi Piatti) and tagged Cooking, family recipes, Food, Italian, Recipes, Rice by ChgoJohn. Bookmark the permalink. John,mi hai fatto venire appetito, complimenti ,si presenta VERY GOOD!!! Thanks, Tanya, for the kind words. Here duck is a little pricey and I avoid it unless I’ve guests. These posts, though, prove that I can stretch that one duck across several meals and dishes. Put that way, duck is really rather inexpensive. Who knew? This recipe blows my mind. It’s gorgeous! This risotto would look great paired with chicken or pork or haddock, something white whose visual appeal would suffer alongside white rice. You’re so right about the serving. It’s such a great color to play with on a plate. She knows many people. Maybe there’s a hunter among them. The perfect Halloween dish – looks delicious! That’s interesting about the two black rices in Italy, John. I’ve had the Asian Forbidden Rice but it was a very long time ago and I can’t remember what it tastes like. For the mushrooms, I usually soak them overnight (no need to worry about overcooking them) in room temperature water, but remember to cover them otherwise your home will smell like mushrooms. I always save the mushroom ‘stock’ too, it adds such great flavour to the risotto. There is something so magical about mushrooms and butter and although I try to cook on the healthier side, I will NEVER pass up the butter in my mushroom risotto! I’ve probably mentioned this story before but quite a few years ago, we were staying at the Seminole hotel in Fort Lauderdale and as I was on the stair machine I was watching one of the hotel chefs make risotto on TV. What shocked me was the amount of butter he added at them end…I’m talking pounds! Yes, his quantity served about 10-12 people but the proportion was still whacked! To be honest, I haven’t been able to order it in a restaurant since then. Not that all chefs make risotto with pounds of butter, I’m guessing there is usually more butter than there should be (no wonder it’s so damn good!). Hope you’re having a lovely fall, we had one really nice day yesterday (it was even warm) but it ended in rain and today is just yucky. Hope this doesn’t mean we’ll have a nasty winter again. You and JT are very health conscious with your diet. You must have been horrified to see all that butter added to the risotto. I, too, like a little butter in my risotto but that was overkill. Risotto is one of those dishes I so rarely order when dining out. Mom really spoiled me and I’ve been disappointed too many times. As a result, I never order risotto, ravioli, nor lasagna — unless I’m in Italy. Then, watch out! It’s tough as good cooks, there are several dishes on the “no order” list because we make them better at home! You’re certainly wringing every last morsel of flavor out of that duck! Good job — too many people never make stock from their leftover carcasses. (That sounds a bit funny, doesn’t it, but you know what I mean!). Lovely risotto — I haven’t made one in ages. Great recipe, and I’m looking forward to that goat! Thanks, John. The best part of these dinners was that the risotto and ravioli were full of duck flavor. I was a little concerned that there wouldn’t be much left for the risotto. I almost reserved the porcini soaking water for fear it might be too strong. I could not have been more wrong. The risotto was full of flavor. I will be doing this again — and soon. John, I have my plate and my place setting out. I will wait for the duck to arrive. I’ll look for a slightly greasy stain on the outside of the envelope as that always signals there’s a duck in there somewhere. Haven’t had duck in many moons. This looks lovely. Risotto is a bit of an art form to my mind. The first chef we interviewed when planning to open the restaurant flew in from the east. In our kitchen in full chef garb he created a beet risotto which looked beautiful but tasted somewhat disappointing. The third chef on the scene, Todd, to be our chef in the restaurant, made the most delicious porcini mushroom risotto I’ve ever eaten. I would bet this was just as good. and with the duck wonderful Goat. Hmmm, not sure about goat. Just kidding. Sorry. I’m in a 12-step program for my puns these days. I wish I could be a fly on the wall for one of your pasta making sessions. Never done that and very interested in seeing it done. What a delicious recipe, John. I love riso Venere but I usually cook it with shrimps or other shellfish. I must try this new way. Grazie per l’idea! Thank you, Silva. I will be eager to see how you prepare your version of this risotto. Your dishes always sound delicious and are so very well presented. Thank you so much. I posted Tortino di riso Venere on 2nd October 2013. 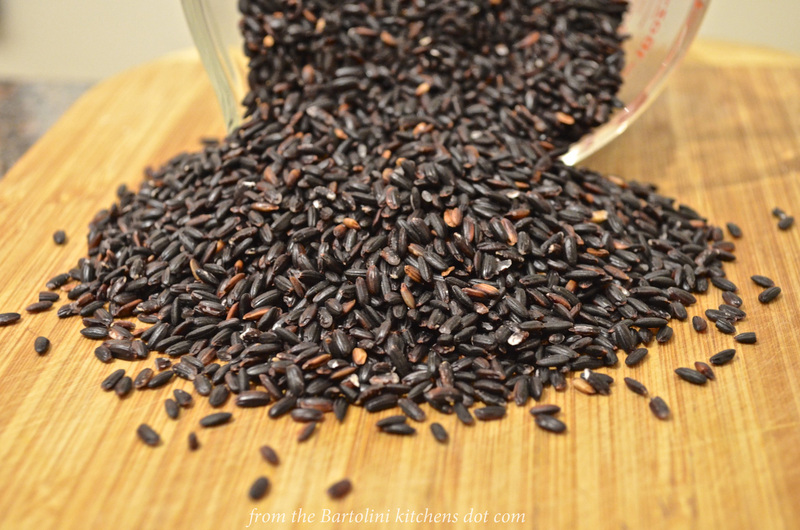 Maybe you’d like to see my recipe with this fragrant black rice. What a beautiful colour! I know, I find black quite beautiful 🙂 I adore risotto as much as I adore pasta. 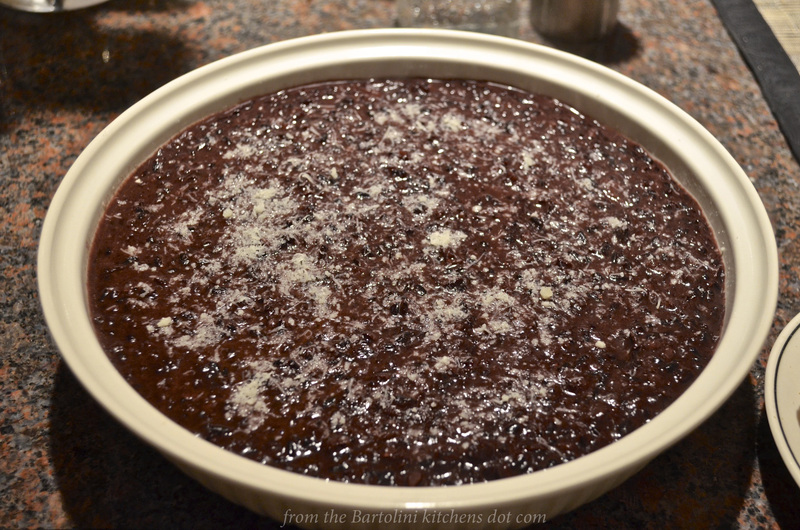 So, this black rice, you said it’s a cross, does it get creamy like arborio? I’ve had the black Forbidden Rice and I thought it really was no different to brown rice. Does this rice tend to stay chewy like brown rice? I’m curious to try this now. I like brown rice so it’s no problem for me. A cross between my two fave rice seems like too good to be true! It’s been a while since I’ve had risotto. Time to change that! I’ll have to hunt down the black risotto rice. Thanks John, for another fab recipe!! I found this rice to be just a bit more chewy than normal Arborio — and I loved it. Yes, the risotto was creamy. In fact, the “cream” was black in color. It proved to be the perfect vehicle for the duck and porcini. That I know, there’s only 1 store here that carries the rice and I bought some just yesterday. I haven’t got the duck yet but I will — and soon. This looks wonderful. I have not heard of this,particular rice, a nice twist for risotto. I was just telling my husband the other day that we should have risotto soon. It is finally cooling off a little and I can think about making it again! Fall is definitely risotto season around here and, from what I’ve seen, a few other blogs. For my family, it’s real comfort food. Black rice isn’t very common and sure does up the “Wow factor”. This is a striking and beautiful dish. I am familiar with the Chinese black rice (forbidden rice) and black glutinous rice but did not know about Italian black rice, I will be looking for it when I go to an Italian market, learnt something new, thanks. You sure got your money’s worth from that duck. Would love to be feasting on a bowl of your risotto this very moment. Thank you, Norma. I’ve never tried the Chinese (original) varieties of black rice. I should look for them, too, just to see how they’re cooked and taste. When you consider that we got 3 good meals — with more in the freezer — that duck probably cost what a chicken would have cost us at the grocery, maybe less. Such a bargain! You should give black glutinous rice a try too. You definitely got your money’s worth with that duck. You know, Debra? We did have a wonderful time together. The last time she visited was 14 years ago with Mom, who was ill at the time. She’d insisted, though, on spending Thanksgiving here, in Chicago — and she made it! It was so nice having Zia back here and cooking for her on my own turf. I know she enjoyed herself because she’s agreed to come back next year. YAY!!! Thanks for the kind words regarding today’s dish. There is a definite “Wow factor” with it. I only know of 1 store here — Eataly — that carries it and you can find it on Amazon but it’s much more expensive. Best to try and find it locally. Hope you’re having a great week. Beautiful black rice John. I have blackened arborio before using squid ink. This is lovely, and healthy. I am suffering ink envy. Black rice is so beautiful. This recipe sounds incredible! What an unique idea, John! I have never thought of using the Venere rice for a risotto! It looks stunning! Delicious! Duck and porcini go beautifully together in risotto, I often braise legs and thighs especially, cooking the meat and making stock at the same time. I’ll have to look out for black rice to turn the wow factor up a notch! Thanks John! No matter how full I feel, I’m always hungry after reading your posts!!! That’s a wonderful compliment. Thank you. Great risotto, John! I’ve never seen black risotto without squid ink before and will look for it. Being wholegrain it must have more flavor of its own, and the longer cooking time allow it to absorb more flavor of the stock! Last time I had leftover duck I used meat and stock to make a Tuscan duck pappardelle. It’s fun to see how much your risotto cooking technique resembles mine 🙂 including making your own stock and using porcini soaking water. As for the duck, any thoughts on wild vs farmed? Hello, my gallivanting friend! I only know of 1 market in town — other than Amazon — that sell black rice. We can to there when you come into town next time, or, I can buy some and bring it to you the next time I come down to the farmy. I go there on my way home from a Dr or Dentist appt. Little kids get a lollipop reward when they go to the DR; I get Italian goodies. I had a Dr appt on Thursday and on the way home I bought more black rice, squid ink for pasta, and some cheeses. The kids can keep their lollipops! Although it’s not raining anymore, yesterday morning’s sun has left us and it’s pretty dreary outside. So glad to see you’re on a beach with warm weather. Soak up as much as you can. Autumn will be here waiting for your return. Black rissotto – nope, we aren’t that sophisticated here yet. What a mouthwatering meal John. Fabulous! Have a beautiful week. Things are going mad here – not all good either. We have had large amounts of break ins and have had to implement patrols and and and. If I though it would make it through customs, I’d send you some black rice, Mandy. But the rules governing food stuffs are a complicated mess, if ever there was one. Sorry to hear of your crime-related problems. I hope you and your neighbors can keep your area secure. Stay safe, my friend. I havent used black risotto rice. i must amend that!. I have to say you have really got me here because the flavour of duck and porcini together would be heaven they are two of my favourite things. Damn delicious and fancy meals…..
i only do salad with black rice, this is a great idea!!! What incredibly beautiful rice that is and your risotto defies words…it is simply incredible looking. I find it so interesting that you put the duck in before the risotto has completed cooking. Don’t know why since one does this in casseroles as well, but I’m sure the moist duck meat helps to infuse the rice even more. Wow. Many thumbs up, John. Love this dish! Wow, as I read the title I thought to myself, John is sure getting every bite out of that duck. What an absolutely beautiful and unique recipe. I’ll bet it was mouth watering. I can’t say that I’ve seen any black rice around in our regular grocery stores but it’s possibly something to look for in the specialty shops. I can’t say enough about how stunning this is John. Thank you so much, Diane. I will say that Zia and I smiled all through dinner that night. You may be able to find Riso Venere in a well-equipped Italian market. I’ve seen it on Amazon but the price is a bit high. You may find it in one of NYC’s Italian markets, but beware of the shipping costs. I tell you, Diane, it’s worth the effort searching for it. Good luck! Ah, then the North End in Boston is where I shall focus. Thank you. Thank you for rebloging this recipe. I’m glad you enjoyed it. Wow! It looks impressive and tempting! Love risotto! Thanks. If you love risotto, this dish is for you! Riso venere is really special and worth searching for. Oh wow that looks so wonderful. I hope to have duck this winter, waiting on hunting season to start and my hunting friends to get out in the woods. How I envy you, Greg. I had those connections when I lived in Michigan but they’re long gone now. I’ll keep searching, though. I’ve honestly never made duck myself…don’t really know why, but now I have no reason not to seeing that you have posted several ways to prepare and use up the duck – carcass and all! I’m liking this black risotto for a fun Halloween dinner! Hi, Linda. You know, that duck was probably one of the most economical purchase I’ve made in a long time.e had 3 fantastic meals from it — and there’s still ravioli in the freezer. As a result, there will be quite a bit more duck being served around here. Someone else mentioned the rice and Halloween, a connection that had escaped me completely. Add a little orange or red decorations and you’ve got a plate of scary risotto. Boo! I was planning to make the tricolour but am still procrastinating, as usual. I would probably use the one from Asian Forbidden rice. One hour is not so long. The risotto in the final picture looks awesome. I wish I could taste it. I am sure it tasted really good. Have a pleasant week. John. I am heading back to Ontario! Duck is such a wonderful thing to eat and I love that you have made full use of this one. I am staying tuned for the goat…just had a most fabulous lunch at Sitka and Spruce in Seattle that included goat braised to perfection with thinly sliced, raw porcini mushrooms and the best roasted, browned squash I have ever eaten. Thanks, Stacey. In a way, this duck was a personal test. I’m aways saying that nothing is wasted in a traditional Italian kitchen and it was time to put my words into action. And it worked far better than I thought it would. how delicious! Love different colored rice. And how great that it’s a vehicle for leftover duck 🙂 Yum. I hope you have a wonderful day, Melanie. I’m going to bed now. Bonne nuit, mon amie! Thank you so much. I hope you do find a duck and use the stock to make our risotto. We really enjoyed it and the riso venere was wonderful. Hello, K … Good to see you and I’m glad you liked this recipe. We sure did! I have never eaten black rice but with the delicious duck I bet the flavours were amazing together. I am thinking about making risotto for lunch as the boys are already foraging in the kitchen on their day off and they just only finished off breakfast moments ago. I need something hearty to hold them off until dinner. Great recipe! Buona serra, BAM! I loved it when Mom served risotto for lunch. It was almost as good as when she served pasta. 🙂 I must admit that both Zia and I were surprised at how much we enjoyed this rice and risotto. It really was that good and I’ll be making it again, sooner rather than later. I’m another one who has never seen black risotto before. But I can imagine how wonderful it tastes, and how it might pair nicely with duck. Also, I love how you refer to your Zia’s visit as “The Visitation”. Very good. i risotti sono la mia passione, però il riso nero non l’ho mai mangiato, ho mangiato un semplice Cannaroli con il nero di seppia, questo sì! Thank you so much, Ventis. You are always so kind when you comment here and in reply to my comments on your blog. Love that you savored every bit of the duck and it’s flavors available, John! I imagine the stock provided not only deliciousness in every bite, but a wonderful aroma as well. 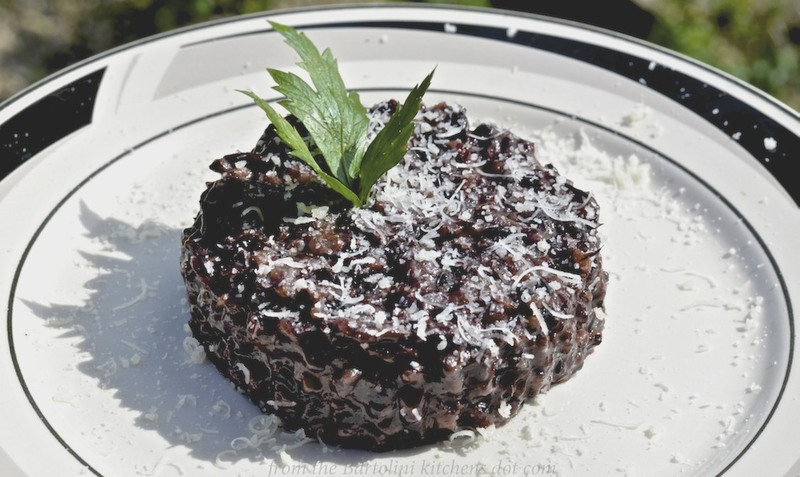 The black rice provides such an elegant beauty to the dish…great photos! I imagine the flavor of the porcini mushrooms (I’ve yet to find fresh either) elevates the flavors…yummy! A very elegant presentation John. Looks and sounds delicious!